From lakebound house-boating to exploring floating markets, and meeting tribespeople in the Himalayan foothills, this Kashmir cultural holiday is full of charm. You’ll fly from Delhi to Srinagar, after a day exploring the capital’s key landmarks including the Red Fort. On arrival, a short stay in a beautiful houseboat on Dal Lake beckons, an excellent base from which to explore Srinagar, or simply relax and soak up the magnificent scenery. ‘Shop boats’ will come from time to time, as locals come to show off their trinkets and other wares, another excellent opportunity for cultural encounters. Getting around further the waterways beyond the Vale involves taking to shikaras, which are small, gondola-type boats, and comfortable mobile camps in wilderness areas. You’ll hike a little in the Sonamarg hills, learning about tribal ways of life and admiring the stunning Himalayan views. Hop from lake to lake, not missing the water lilies of Mansabal Lake, before another couple of days at leisure in Srinagar. You might wander the floating vegetable market, or the bustling bazaar, both of which are fantastic for photographers, or simply do a little golfing and shopping before a return flight to Delhi and a farewell dinner as your small group disbands. Kashmir was for centuries a pristine resort for Moghul and British rulers, and after you’ve spent just a few hours here, you won’t find it too difficult to understand its appeal. Our “Leave No Trace” ethic is applied to this trip to Kashmir. We have a strict environmental policy to make sure that the fragile eco-structure of the land is not damaged or spoilt in any way. Our guides are trained to uphold this policy and all clients are fully briefed on appropriate/responsible behaviour whilst in wilderness areas. 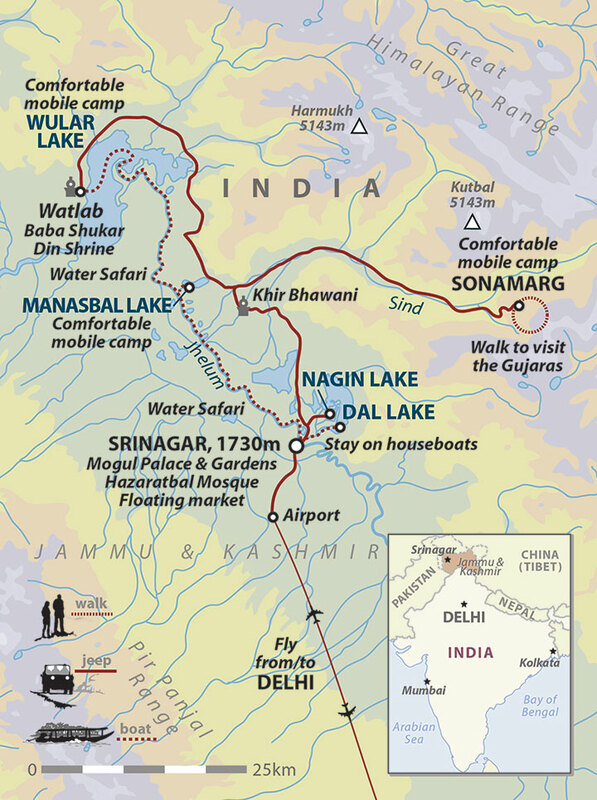 This policy will be applied especially during nights when the group will be camping, such as on day 4 when they will camp on the edge of Manasbal Lake and day 5 camp will be set up on the edge of Walur Lake. The tour leader will ensure that the sites are left as tidy as they were before arrival, if not tidier to ensure the environment is totally unaffected by the groups presence. We also support several NGOs around the world such as the TESFA community project in Ethiopia, Adopt-A-Minefield in Afghanistan and Children of the Caucasus a great little charity that helps orphaned children of Georgia and the Caucasus through art, theatre and education. All agencies and NGO's are carefully selected to improve the standard of living for the communities we visit. On this trip to Kashmir we employ the services of local guides and drivers, stay in locally owned houseboats, hotels and guesthouses – which diverts important funds directly into the area. The wonderful thing about this kind of interactive tourism is that everyone gains – the locals financially, and our clients with the unique experience and social interaction. For three days the group will travel on the local boats - shikaras - north of Srinagar so money goes directly to the locals that run these boats. You will encounter the local Kashmiri people that make their living with their small shop boats selling all sorts from jewellery and flowers to pashminas and food that come straight to your shikara. In India, we have implemented tree planting schemes (a hands on experience for some of our trips!) as well as helping directly with the financing of rural village schools. In Calcutta we support the Hope Foundation, an organisation devoted to helping and improving the living conditions of street children by offering education, health services and nutrition and to help give them a better chance in life.